To contribute to a significant change in society and in the world is a big challenge especially when it comes to changing people’s lives, people whose lives are dependent on charity organizations efforts. We want to strengthen, uplift and support the charity organizations so that they can, according to their best abilities, promote equality and create greater awareness of the cause. With the right tools and good partnerships Light Up the World will make a difference in helping organizations’ efforts. Our goal is to establish a fund in which these organizations each year can apply for funding to promote their programs and projects. Our grants will strengthen the organizations visibility with sales of matchboxes with their own custom designs. By investing in these organizations Light Up the World will build a brand that contributes to the survival of people who need it most. With our partner organizations and our matchboxes we will be creating greater opportunities for individual charitable contributions. What is Light Up the World? We see a brighter and warmer world where charity is changing people’s lives for the better. Through our boxes of matches we want to raise awareness and create a unique world in which the human and the butterfly is in the center. 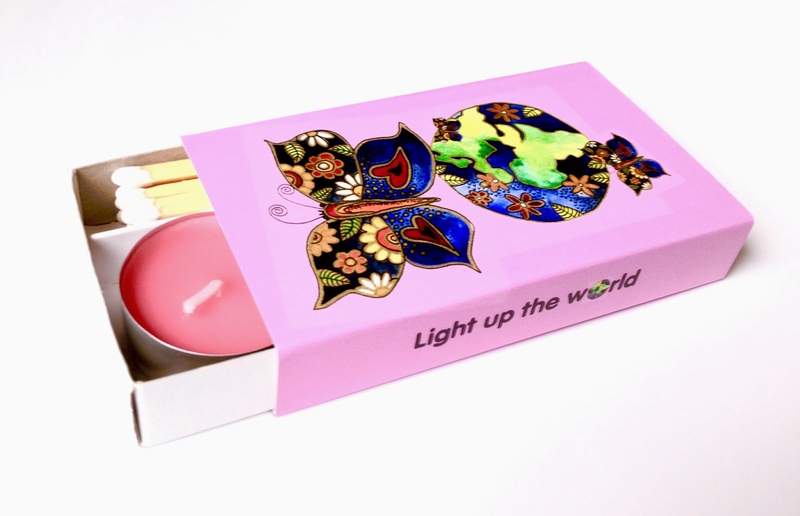 Light Up the World is a foundation with the purpose of collecting revenues through the sale of custom design matchboxes. Every year the proceeds from the sales will be handed out to our partner organization of choice in the form of a lump sum grant. Selected partner organizations sell our matchboxes with customized designs. The proceeds will go to the Light Up the World Foundation that every year picks a partner organization to receive a lump sum grant.